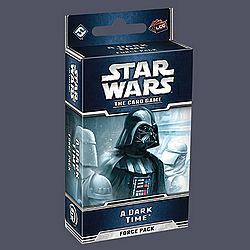 The Battle of Hoth heats up in A Dark Time, the second Force Pack™ in The Hoth Cycle for Star Wars™: The Card Game! Rebel forces prepare for evacuation, and Imperial walkers advance and open heavy fire. A Dark Time adds more objectives with the Hoth trait even as light and dark side forces prepare to clash for control of the desolate ice planet. New characters, fighters, and locations populate the battlefield and encourage strategies built around assaulting damaged objectives and winning the Force struggle.